Globetrotting superstar Highland Reel stamped his class on the G1 Prince Of Wales's Stakes with a game performance to provide Ballydoyle handler Aidan O'Brien with his 56th victory at the Royal Meeting and his first success of the week at the Berkshire venue. Always prominent after breaking smartly under Ryan Moore, the five-year-old son of Galileo handled the drop back to 10 furlongs with aplomb, finding plenty for pressure in the home straight to repel the challenge of Roger Charlton's Decorated Knight, who was a length and a quarter behind in second, with a short-head back to Sir Michael Stoute's Ulysses in third. Highland Reel took his career earnings to £5.97 million with today's victory, whilst for the master of Ballydoyle, this win is deemed to be his 300th Group or Grade success on the flat and jumps. O'Brien was effusive in his praise of the horse. He remarked: "Highland Reel is a brilliant horse and Ryan gave him a brilliant ride. Davy has done a great job on him and Andrew was over the moon with him, so we were really looking forward to it. Seamus was very happy with his work and Davy, who rides him every day, felt he was getting better and better. They were very confident that he was on the upgrade. "He is an incredible horse. Pace, courage, tactical speed, he has everything. He was back to a mile and a quarter today and we know he gets a mile and a half well, but was a very good Group Two winner over seven furlongs as a two-year-old. He always had that pace. A big credit and well done must go to everybody at home that is involved with him. "He has been racing at the top level for the last few years and he is just amazing. We always thought the world of him because he has always been a natural, brilliant athlete. Sometimes he gets beat, but if the pace is strong and if it comes anywhere near courage, then he will be there fighting. He has danced every dance. He has awful lot of tactical speed and that is a huge asset to have in a horse. I'm not sure we have ever had a horse with the constitution that he has." O'Brien suggested that a return to Ascot for the King George VI & Queen Elizabeth Stakes (sponsored by QIPCO), a race which Highland Reel won last year could be next on the agenda. He is 6/4 with Ladbrokes for the G1 event. O'Brien continued: "The plan was to come here for this race and then come back to Ascot again for the King George but we'll see what the lads want to do, but that was what we were thinking." Reflecting on reaching 300 Group and Grade One victories, Flat and Jump, O'Brien remarked: "We are a small part in a massive team. It's all pure teamwork by all the people involved in this process. It's a huge chain of people involved and we feel privileged to be a part of it. The lads make it happen and we are so grateful to them for helping guide us along. 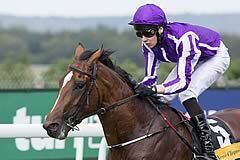 Tom Magnier, son of one of the joint-owners John and Sue Magnier, said: "We are lucky to have a horse like him. He is tough and run some great races and today's victory is one of his best. Some people might have thought that 10 furlongs was a little bit short for him but he has a lot of fight and he showed that today. Ryan gave him a fantastic ride and they didn't give up on each other - it was a great result. It was a great race and that is what everyone comes here to see, but when you've got Ryan Moore on board, that is an advantage and Highland Reel just keeps finding. He has a fantastic temperament and he doesn't give up. The King George would be a great race for him but we will first take him home and see from there." Highland Reel's victory was a 44th Royal Ascot winner for jockey Ryan Moore, and a first in this race which, with a £750,000 prize fund, is the most valuable contest of the Royal Meeting. Moore said: "Highland Reel has a marvellous attitude, like so many of these Galileos. They were the first three there [second-placed Decorated Knight and Ulysses, third, are both sired by Galileo as well]. "Highland Reel has been everywhere and keeps coming back. It was a tough performance at Epsom [to win the Coronation Cup] and he has come back after not that long a break. I'd say it was probably a career-best from him today. "Fair play to Aidan for getting him back after Epsom. He had a difficult day that day [the plane bringing O'Brien's horses to the track was delayed and Highland Reel arrived at Epsom just over an hour before the race] and to then come here and win, it is a massive performance by him. "We knew he would see it out real well and the last furlong was his best. "He's always tried very hard. Aidan always does a great job of getting him back [from his races] quickly; obviously he's a very tough horse but he's a high-class horse as well. He's a King George winner, a Breeders' Cup winner, a Hong Kong Vase winner... He often brings his best, as long as he gets quick ground, and he's a very good horse. "He deserved a big win here today. We're delighted with him and it's been a big effort from the team at home to get him back from Epsom and here today." Connections of the second and third could not have been too disappointed at finishing placed behind such a consistent and superb performer as Highland Reel, and Roger Charlton, who trains Decorated Knight, said: "He was a 10/1 shot and fourth favourite in the betting, but every time he runs he improves. Every time he finds a bit more. "Ulysses looked as though he had gone past him, but he battled back. I'm really pleased, and it's no disgrace to be beaten by Highland Reel. "I think he is suited by being trained mainly by himself and in the nice, calm environment of Beckhampton, which is quite different from Newmarket, where he was trained before [in 2014 and 2015]. He travels well, and we know, that like a lot of Galileos, he can get quite sweaty, but it doesn't affect his performance. "I need to talk to the owners, but the Arlington Million is a possibility again [he missed the race after picking up an injury before last year's race], as is the Coral-Eclipse - after a performance like today that is a race that could come on the agenda." Imad Al Sagar, the joint-owner of Decorated Knight, said: "I'm very happy - he has proved himself a top-class horse and among the best mile and a quarter horses around. He's consistent and keeps improving every race. "Roger has done a great job on him, and I think this is the horse's best run to date." Sir Michael Stoute, trainer of Ulysses and fourth home Queen's Trust, said of the first-named: "I think that's his best performance to date. He's developed very pleasingly from three to four, and he is mentally more mature - he relaxes more. I can't make a decision about what he does next when he's just run in 100 degrees heat - we'll have to see how he recovers. "Queen's Trust ran a blinder. She was interfered with soon after the jump off, but came home as well, or better, than any of them." Sent off the 2/1 favourite, Jack Hobbs came home eighth and last in the 10-furlong Prince Of Wales's Stakes. When the 2015 Irish Derby winner, who sat toward the back of the pack through the early stages of the race, was asked for an effort by jockey William Buick as they entered the home straight the five-year-old colt never extended. Trainer John Gosden commented: "Ground. Obviously, that trip on that ground is not his scene. A mile and a quarter here in the Autumn on soft - no problem - but this just isn't his ground. "He didn't let himself down on it. He came with every chance in the straight. "You always notice with a horse whether they get low and race but just stay on the same lead [leg] coming back off the ground." Buick added: "The ground is a bit lively for him and he is probably a mile-and-a-half horse. He hasn't been disgraced at all and when he gets his conditions he will be back."